The rain finally stopped this morning. 2 1/2 inches in total on the pumpkin patch. Lots of lime green leaves because the soil is saturated and the roots are having a hard time getting at nutrients. I did a foliar application of magnesium sulfate (Epsom Salts) and multi-mineral this morning. I'll do this regularly to help with the deficiencies that the tissue test showed. I also did a granular application of nitrogen to get those leaves greened up. The application rate that I did for the nitrogen is about 1/3 of what the soil scientist recommended. I'm going to do those in divided dosages to the amount that the report said. This soil scientist I know knows more about soil and what an Atlantic Giant pumpkin needs than probably anyone in the world, but he isn't a grower and my concern is that if I put down all of this nitrogen at once I could blow up the pumpkin. I also put down with the nitrogen a little fulvic acid to help the plants get at the nutrients. Note from the evening: It is interesting what a little sun and fertilizer can do. At dinner time the plants have greened up a lot. Once that nitrogen kicks in over the next few days we should be in good shape. It has been raining like crazy for the last 24 hours. Two inches so far in the pumpkin patch. I like a good rain, but this is a little too much. I got my tissue test report back just now. I'm glad I sent it in because what has been going on makes a little more sense now, although some of the numbers are a little surprising. I sent in two leaf stalks on Friday and the lab gave me a pretty detailed report along with recommendations. In the spring I sent in a soil sample and had it tested so I know what my soil had it and I amended it accordingly. The interesting thing is that you can be very high in something like magnesium and get a tissue test and it will show magnesium low in the plant. That will be somewhat explained later. My soil was high in sulfur, phosphorus and nitrogen in the spring. My tissue test shows low numbers for each of those items. Some of this I can't explain very well. Others I know are being blocked from being taken up by the roots because other nutrients that are a little too high in quantity are taking up the cations or places that they can be absorbed by the roots. The tissue test also showed I was low for zinc, manganese and copper. Those I'm traditionally low in and apply foliar applications to help with that. What I'll be doing over the next few weeks is applying regular foliar applications of nitrogen, phosphorus, sulfur, zinc, manganese and iron. I'll also apply some blood meal to the soil to increase the nitrogen. This tissue test explains what I've been seeing in the plants. The lighter colored leaves near the vine tips is from a lack of nitrogen and magnesium. It is more pronounced right now with all of the rain going on because nitrogen and magnesium are hard for the plant to uptake with the saturated soil. This evening I did an application of fish & seaweed. With all of this rain I don't want to over do it but I also wanted to correct these deficiencies right away to get the pumpkins growing better. This evening I applied Biotmax and Azos to the soil under the leaf canopy with a little liquid seaweed added. As I talked about before, Biotamax has beneficial fungi and bacteria that help feed the plant and protect it from harmful bacteria and fungi. 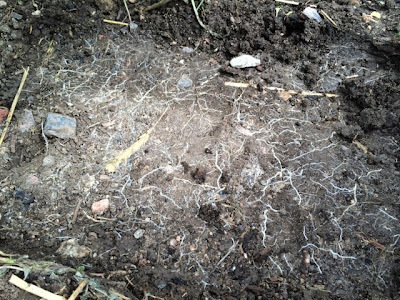 This helps create a 'soil food web' that helps give nutrients to the plants and the plants in turn give products back to the fungi and bacteria in the root zone that benefits the entire community. I also put down a little granular seaweed, blood meal, gypsum and humic acid. Rain in the forecast so I figured it was a good time to put this all down so it could get watered in. Sunday evening I had a bit of a scare. For three days in a row I saw the pumpkin growth decline to the low teens on both pumpkins. I thought the plants might have yellow vine disease or something else going on. Growth on the 335 pumpkin has stayed low, but on the 1791 pumpkin growth has returned to the low 20s for the last two days. I can't explain it. I don't think it was weather. I've never done bad measurements for three days in a row before so that is very unlikely. All I know is that I'm glad to see the pumpkin growing. It looks like the Johnson pumpkin patch finally has pumpkins on all of the plants. My son's plant, which has last the main vine in two different hail storms, finally got pollinated today. This evening I put down about 2 1/2 gallons of compost tea on each of the pumpkin plants. This one was a quick brew with 2 tablespoons of liquid seaweed added to Xtreme Tea. I have to do everything I can right now to not go out and pour a bunch of fertilizer on my plants. We are in the big growth zone right now and we aren't seeing the kind of growth that I would like on the pumpkins. Both plants grew like weeds over the last two weeks, but the pumpkins aren't putting on incredible inches right now. I have to remind myself that slow and steady wins the race. Like I said before, there are different kinds of pumpkins and the ones I'm growing this year tend to be more of the long growing, no big gains but constant gain types. Trouble is that at this point of the season you don't know if you have a long growing type that is going to go heavy (meaning it will be a thicker pumpkin) or if the pumpkins are just not going to grow well this year. Last year's pumpkin set a bad precedent for me. That pumpkin was a rocket out of the gate. It turned out to be a balloon at the end of the season but it sure was fun to watch grow. 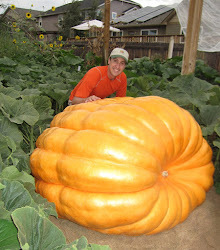 At mid-season it was the second biggest pumpkin, in terms of measurements, at the time of the patch tour ever recorded in Colorado and it was still growing very well at that point. This years pumpkins aren't that way. What counts is were the pumpkin is at come way off time however and ultimately what the scale says is the truth. So at this point of the season if your pumpkin isn't as big as you like or as big as your friend's don't fret it. Do your best and that is all that you can do. This evening I spent a lot of time burying vines. Like I said, the vines grew a lot this last week and I had some catchup to do. Right now my 1791 plant is almost exactly the size my 1421 plant was at the beginning of September. I've terminated a lot of vines this week as the plant has filled its space. By the end of July the 1791 will have filled up all of its available space before the pumpkin. After the pumpkin the plant isn't growing as fast since the pumpkin is sucking up most of the energy right now. The 335 plant should have filled in all of its available space before the pumpkin in the next two weeks. Recently I've had a number of emails from growers talking about cracks forming on the stem of their pumpkin. 95% of the time, at this point of the season, it is because of roots on the main vine just before, just after or directly under the stem or on side vines right next to the pumpkin that are holding the stem down as the pumpkin grows up. At each leaf node a root will form out of the bottom of the vine and out of the top of the vine. You need to remove those roots and any dirt covering the top of the vines so that as the pumpkin grows the vine can lift up with the pumpkin. Otherwise those roots will hold the vine down and something has to give and usually it is going to be the stem of the pumpkin. I pull all of those roots up early on and then check to make sure the vine has a little slack in it as the season goes on. You can crack the stem and vines if you don't watch it closely. I've had it a couple of times (this year as a matter-o-fact) where I pulled the roots up and a week or two later they had reattached to the ground so you have to watch them closely. This evening I sprayed some foliar multi-mineral on both plants. I was up in Canada all this last week. Joe was good enough to watch my plants while I was out of town. Everything is pretty much automated as far as the watering goes, but that doesn't work so well when the water is turned off. Fortunately Joe was over to check on the plants and gave them a drink and got the water going again. A big thanks to him for his help! The 1791 pumpkin grew nicely while I was out of town and got more orange. I noticed something this evening on that pumpkin. If you look at the upper right hand side of the first picture you'll notice a bump on that side that the other side of the pumpkin doesn't have. This is an unusual trait that the world record 2009 pumpkin had where there was more mass on the right hand side of the pumpkin then the left. Kind of an unusual genetic trait. The 335 pumpkin is a fair bit smaller than the 1791. I'm hoping this one is a late grower because it isn't showing a lot right now. This evening I gave both plants some foliar fish & seaweed along with Lithovit to help with the heat wave that started in Colorado today and will be around all of this week. There was a sand bag the I moved yesterday that is about 10 feet from the stump. You love to see pumpkin roots like these on a plant. Had a very nice time with a number of growers at the Wiz's pumpkin patch last night. A little BBQ and a lot of talk about pumpkins. Some very nice growth on the pumpkins the last couple of days. I was beginning to wonder. At about day 22 after pollination the pumpkins tend to start kicking it into gear some and around day 28-30 they should start cranking it up. However, not all pumpkins turn up the speed the same way. Some are more slow and steady but end up huge. They don't do any big gains on any one day but a whole lot of medium gains. Other pumpkin rev up really fast and then drop off a little more quickly. My pumpkin last year was kind of that way. And then other pumpkins never crank it up and never amount to much. Saw a nice pumpkin yesterday. Joe's 282 Scherber. I'm sure he is working extra hard on that plant just to put in my face, since I pulled my 282. Today I setup little structures over the pumpkins to help keep them dry. I basically bent pvc over the pumpkins and then clipped silver tarps on the pvc. Not completely necessary, but it worked well last year. The following is the latest pics of the 1791. I forgot to take a picture of the 335. Both pumpkins are getting more orange each week. This evening I did a drench of Xtreme Tea aerated compost tea on both plants that that had a cup of fish & seaweed added to it along with a little Actinovate and Azos that were added at the very, very end of the brew. This evening I gave each pumpkin plant about a quarter of a cup of blood meal, quarter cup of humic acid, quarter cup of gypsum and a quarter cup of alfalfa meal. Although color has been good on the 335 plant, growth of the vines and the size of leaves indicates to me that I might be a bit low on nitrogen in the soil so I want to see what that does to the plant. The blood meal will be a faster releasing organic nitrogen source and alfalfa's nitrogen will release a little more slowly so the plant gets a little more sustained nitrogen over the next few weeks. Typically you don't want to feed the plant all at once. Divided, smaller does seems to be better and you will see less problems with the plant and pumpkin. I may not have a world record this year, but since both pumpkins are already turning orange I might have a shot at a Howard Dill award for prettiest pumpkin. Both are lightly ribbed pumpkins and should have good color if they don't cantaloupe. If there is anything that you have to be able to do in giant pumpkin growing is be able to change your plans. Growers will spend a good part of the winter planning out what crosses they want to make only to not have a male flower available the day the female flower is to open. Today I had to make my change in plans. I had my vine on the 335 Scherber placed perfectly for the 2nd pumpkin pollination but it wasn't meant to be. That second pollination hasn't aborted yet, but I've seen very little growth on it in the last two days. The first pollination seems to be sucking everything out of the plant so the second pollination isn't going to make it. I could cut off the first pumpkin, but there isn't any guarantee that the 2nd pollination will make it so I'm probably going to go with the first. Today I started trying to position the first pollination better on the vine and get some of the side vines out of the way. I'm going to have some trouble later in the year with this pumpkin but you have to take what you can get sometimes. This evening I gave all of the plant a foliar application of multi-mineral. Only in Colorado can you have a 101 degree day and then have the ground covered in ice at the end of the day. About 1 hour ago I saw flash of light at a rate of about once per 2 seconds. At first I didn't know what it was but then I looked out the window to the north and could see green colored clouds moving very quickly towards me. It was a wall of clouds that were massive and I knew it was going to be trouble. I know better than anyone else what a massive hail storm will do to a pumpkin patch more or less a house. Within minutes the winds increased incredibly. Only one other time do a remember the winds that strong. Looking from a second story window towards the pumpkin patch I could see my hoop house to the side of the pumpkin patch had its plastic shredded. I've had hoop houses in 50 mph winds and never had a problem. This is 6 mil plastic so I'm not sure how fast the wind was going but I wouldn't be surprised if it was around 100mph or more. Then the rains came and it was a downpour. Within seconds after that the hail started. At first it was dime sized and then some quarter sized hail started coming down. The nail never came down super hard which is the only reason anything survived. About 20 minutes later it stopped and at about 30 minutes the skies were mostly clear. I went out and checked the plants. Both of my kids plants have a fair amount of holes, but the plants weren't shredded like I would have guessed they would be. Vine tips seemed to still be in place and the female on my daughters plant that will be opening tomorrow seemed to be fine. I put a chair over it a couple of days ago so I'm sure that helped save it. My plants surprisingly did well. I knew that they wouldn't be in horrible shape because I could see the hail netting was protecting the plants for the most part. I was concerned that the 335 Scherber plant would be beat up on the north side where the hail had blown under the netting. It was dark and hard to see well but it looked like the vine tips were still in place for the side vines. There was definitely holes in the leaves, but not bad. The 1791, considering the force of the storm, was hardly damaged. It is on the south side of the patch so it was the most protected under the netting. Some of the leaves on the west side had some holes in them but all considering I feel pretty blessed that there wasn't more damage. This evening I gave both pumpkin plants about four gallons of aerated compost tea (2 gallons per plant). As noted before, compost tea typically doesn't have much in the way of NPK or nutrients. The reason you apply compost tea is for the biology. I'll use different things for my compost tea. Today, in a paint strainer's bag, I put in about a half a cup of earthworm castings, about a quarter a cup of alfalfa pellets and one old, dried leaf. That was put into a 4 gallon container that had water in it that had sat for about 24 hours so the chlorine from the tap water could evaporate. I then had air from a fish tank pump bubble through the water to aerate the compost which will help keep harmful organisms from developing in the water. At about the 24 hour mark I added about 1 1/2 tablespoons of un-sulfered molasses to the water. That will allow the bacteria a food source in the water. I then brewed it for an additional 8 hours. After that I pour the compost tea on the leaves and ground. I usually put the compost tea in a watering can then swing my arm in a sideways motion so that the compost tea will splash across the leaves. Often I'll pour a little near the stump and on the area of the main vine as well. The friendly bacteria and fungus from the compost tea should help protect the plant and help the plant get at nutrients in the soil. This evening I put down some granular kelp just beyond where the vines have grown. I also gave both plants a foliar application of fish & seaweed. I felt like the 335 needs a little nitrogen and the Neptune's Fish & Seaweed would give it just the right amount. Below are pictures of the two pumpkins that I'm planning on going with the first is "Bo" the pumpkin on the 1791 Holland. At only two weeks old he is already oranging up quickly. At this time it is bigger than a volleyball but a touch smaller than a basketball. The 2nd pumpkin is "Lucille." Lucille Johnson was a dear, sweet friend who passed away last year. In her old age and not always feeling well, she always made it out to the yearly pumpkin party to see the pumpkins. I thought it fitting to name the pumpkin after her. Early this evening I hit all of the plants with some insecticide. I was seeing some new chew marks on my daughter's plant so I sprayed them all. Later I hit the plants with a mixture of Lithovit mixed with some calcium and humic acid that I applied as a foliar spray. There was a little leaf burn on some of the youngest leaves because of the heat today and the lithovit will help with that. "Burying vines makes a bigger pumpkin." If I say it enough times then I start to believe it. Why bury your pumpkin vines? Because a root will develop at each leaf node, out of the time and the bottom of the vines. That will double or more the number of roots your plant has by the end of the season and all of those extra roots will help grow the pumpkin. What did I do this evening? Bury vines of course. At each leaf node I added a little myko and then I piled dirt on top of the vines. Again, not one of my favorite things to do this type of year when the vines are growing super fast (I've had to move my walking boards each day for the least three days) but it makes a difference. I noticed this evening that the 1791 pumpkin is already getting orange around the stem area. I've been wondering what side of the genetics I was getting and I know now. The 1495 Stelts side seems to be prominent in this plant. It was what I wanted. Big and heavy genetics on that 1495 with a nice, orange color to boot. 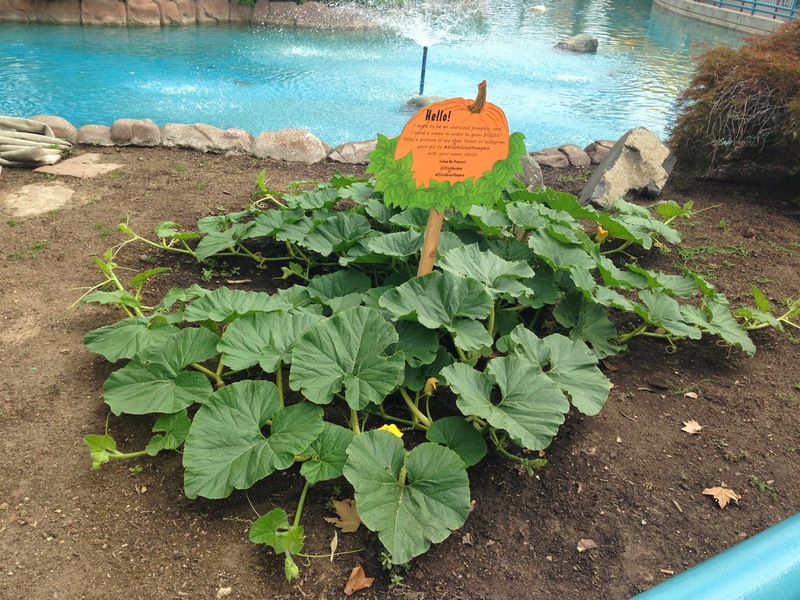 It looks like the giant pumpkin plant that I gave to Elitch Gardens amusement park is doing very well. The pumpkin needs a name however. Use hash tag #ElitchGreatPumpkin on Twitter to put in your vote for their big pumpkin's name. "Weeding is no fun, but it helps grow BIG pumpkins." If I say it enough times eventually you'll start to believe it. Like most people I don't enjoy weeding. One of the biggest reasons I put in a cover crop in the spring is because it helps suppress weeds and when I till that cover crop in I have no weeds for a month. The last week of June the weeds start coming back and so tonight I weeded the better part of 1,000 square feet. With the right tools it goes relatively fast, but me daughter asked, "Why are you sweating so much?" when I was done. It gets a little tiring. The 335 Scherber pumpkin seed is a cross of a clone of a plant that produced a 1663 pound pumpkin with a clone of a plant that produced a 1725 pound pumpkin. I crossed that plant with pollen from a pumpkin plant that is a clone of the plant that was crossed with itself that produced the world record 2009 pumpkin. On paper this is a pretty nice cross. The female that I pollinated this morning was a nice looking 5 lobe flower. As mentioned before, if this pollination takes, I'll grow this pumpkin and take off the earlier pillination because this one has better position on the vine.